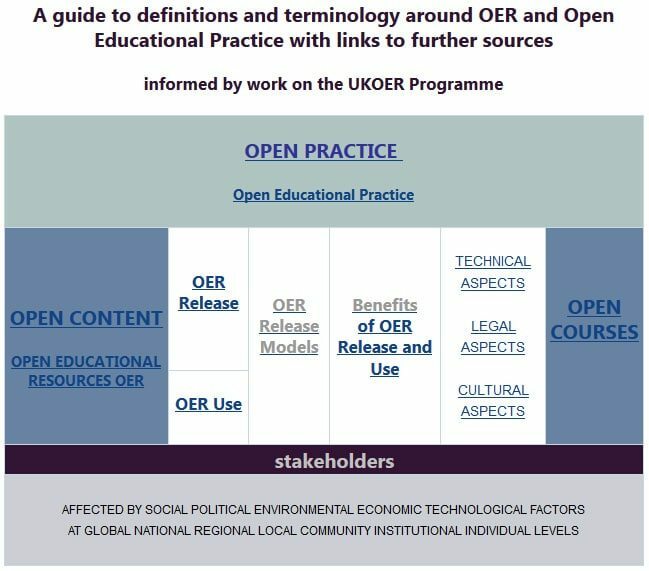 The UKOER programme has investigated many aspects of OER release and use over the last three years and detailed discussion of this is available in both the synthesis wiki and the OER infoKit. Watch out for some other posts about synthesis reports for the latest phase (phase3) and the HEFCE OER Review, which we’ve recently been working on. For over a year Lou McGill has been working on a guide to help people understand the terminology around OER release, use, models and benefits and open educational practice (OEP) that aims to shed a bit of light on how the different terms relate to each other. She uses a thesaurus approach to identify broader terms, related terms and narrower terms. For each term she offers a brief definition and also points people to other sources. Click on the image below to go to the guide which is on the synthesis wiki. One of the challenges for the UKOER programme is that it covers a very wide range of issues and the OER infoKit and the UKOER synthesis and Evaluation wiki both contain loads of really useful resources developed by our team, and also collate those produced by the project teams who participated in the three year programme. So the guide also points you to relevant places on both the OER infoKit and the synthesis wiki. This guide is informed by the work done by the synthesis team and the wider UKOER community – so acknowledgement is due to all of them and also to JISC Infonet who have funded this guide as an adjunct to the OER infoKit. If you spot something glaring missing (bearing in mind it is impossible to be comprehensive when pointing to general OER resources) please let Lou know.